In a large bowl, mix together teriyaki sauce, vinegar, garlic powder, salt, pepper, sugar and vegetable oil. 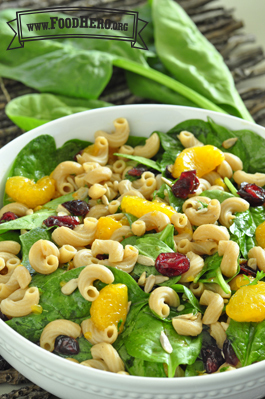 Add cooked pasta, spinach, dried cranberries, sunflower seeds, mandarin oranges and cilantro or parsley, if desired. Mix well. Cover and chill until ready to serve. Try a low fat Asian Salad Dressing from the store to replace the dressing ingredients.